The rustic cabin has a queen size bed downstairs and a full size bed in the cute sleeping loft accessible by the outside stairs. The cabin has a full kitchen with stove, oven, microwave, full size refrigerator and coffee maker. Sorry, but no food is provided. Shop before you come. The bath has a full shower with vanity sink and toilet. Off the bathroom is a large closet with a small washer and dryer for those who plan an extended stay. 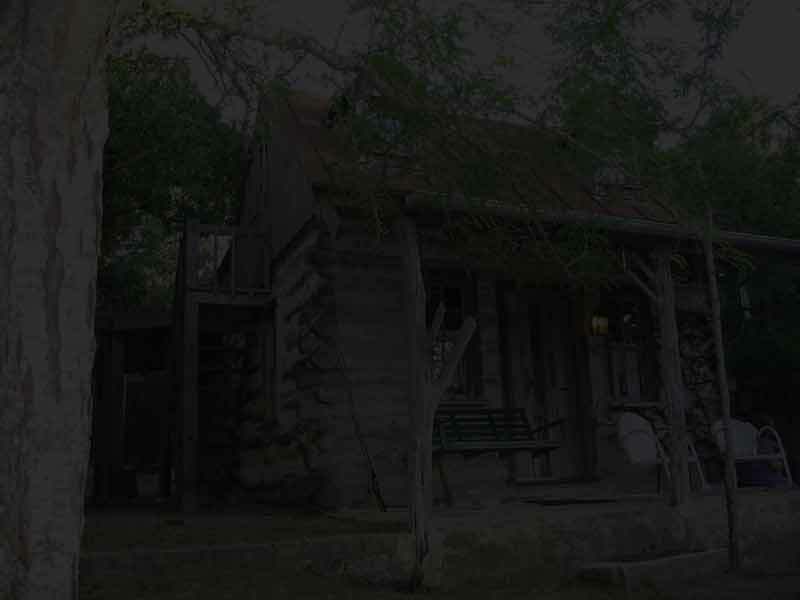 The cabin sits on 120 acres with abundant wildlife, white-tail and axis deer, raccoons, squirrels, rabbits, armadillo and songbirds too numerous to mention. There is a lovely fishing pond directly in front of the cabin. Fish are abundant – brim and catfish, numerous frogs, and of course turtles. Fishing is permitted. Catch and release only please. The catfish range from 1 pound to 12-15 pounds. Scatter some breadcrumbs on the pond the fish will come to the surface to feed and say hello. Hunting is also available upon request. There is a walking bridge across the pond for walking, relaxing or a nap in the sun. A hike on the many trails could yield an arrowhead or two if you have sharp eyes. There is a fireplace to add to the ambience or you can sit on the back porch swing. In the evening you will be serenaded by frogs and beautiful sounds of the local whip-poor-wills. For peace and quiet the cabin is the place to be. Central heat and air make the cabin comfy all year around.